Mostly cloudy, spot showers. Highs in the 50s to near 60. Saturday is picking up where Friday left off: on a gloomy, damp note. Clouds will be persistent this morning, along with areas of drizzle. By this afternoon we’ll still find mostly cloudy skies, but a few hints of sun will develop well inland. 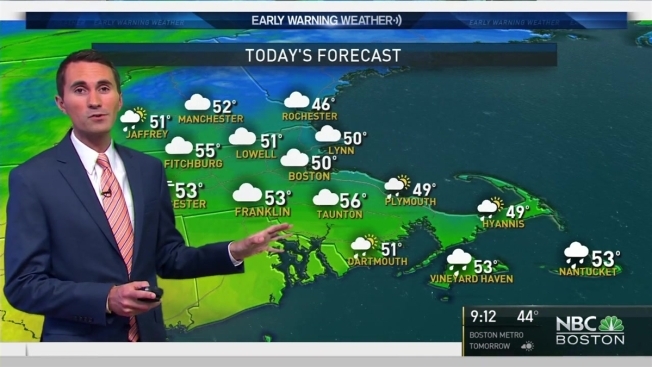 The odds of some sunny breaks are highest in Western Massachusetts and parts of Connecticut. Meanwhile, we’ll have some afternoon showers in the mountains of Northern New England, and for areas south and east of Boston. Highs will primarily sit in the 40s and 50s, but where some sun pokes out we’ll get closer to 60. Skies begin to clear tonight, bringing in more sunshine for all of us on Sunday. Expect highs in the 50s at the coast with a sea breeze, and 60s inland. A storm will spread rain into New England by Tuesday and Wednesday, but after that the door opens to much warmer conditions. Highs at the end of next week will approach and exceed 70.